Today I would like to share the first of several book reviews. In the process of researching metaphors for my book in the past few years, I have read many brilliant scholarly works. One of the books I have enjoyed the most is one entitled Metaphors in International Relations Theory by Michael P. Marks (Palgrave MacMillan, 2011). Professor Marks teaches political science at Willamette University in Salem, Oregon, and has published several books on international relations. I must admit that I do not have much training or experience in political science, much less international relations theory. However, I would like to offer a few comments with regard to Professor Marks’ analysis of the metaphors used in international relations. The book consists of nine chapters. The first four chapters provide an excellent background to the complexity of international relations. The next two chapters consist of analyses of two common topic areas: power and international security. The following chapter details how game theory is used to create metaphors to describe international politics. The final two chapters summarize how metaphors are actually changing how experts understand international relations. In the introductory chapter Marks claims, “…a major contention of this study is that the generally accepted paradigms that are used to analyze international relations are built on metaphorical imagery that provides the very theoretical propositions these paradigms use to hypothesize and make predictions about international affairs” (p. 4). He goes on to provide an excellent summary of research on metaphors. Building on the seminal work of Lakoff and Johnson (e.g. Metaphors We Live By, 1980, and other great works), Marks demonstrates a thorough knowledge of the conceptual metaphor model and applies this knowledge to a very detailed analysis of political metaphors throughout the book. Marks concludes the book by summarizing the importance of metaphors in international relations. He argues that although many theorists are not even aware of their metaphor usage, their metaphors influence the way other experts and the general public think about the issues at hand. Marks claims, “the state of theorizing any given moment in the field of international relations is a direct reflection of the metaphorical language that is shared among scholars at that time” (p. 189). It is difficult for me to pass judgment on the entirety of the book. Not having a background in politics or international relations, I cannot comment on the accuracy of his descriptions of political theories. However, having studied metaphors for about 30 years, I was quite impressed with Marks’ knowledge of metaphors. I am always impressed when scholars from other fields show mastery of such a difficult subject. Marks certainly does this throughout the book. My quibbles with the book are few. I was a little confused in his chapter on game theory. He did not spend a great deal of time explaining the prisoner’s dilemma game and how it is applied to international relations. In fact, my only frustration with the book was that Marks provided great examples of metaphors in international relations, but he did not always provide examples of how these metaphors were used in real-life political decisions or events. For example, how has the “war on terrorism” influenced U.S. foreign policy since the Bush administration? Or how could the “balance of power” metaphor be used to explain the endless battles between Israel and Palestine? Perhaps that is expecting too much from one book. Marks bemoans the fact that no one has written a thorough history of political metaphors. I would love to see Professor Marks write such a book, giving examples of how metaphors have influenced policies and world events throughout history. I definitely look forward to his next book. 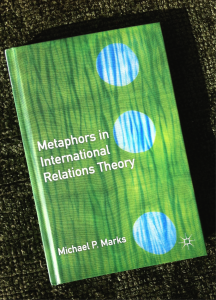 In the meantime, linguists and political scientists would both benefit a great deal from reading Michael Marks’ Metaphors in International Relations Theory. If you are interested, check your local bookstores for a copy or order it online.